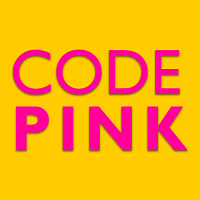 CODEPINK is a women-led grassroots organization working to end U.S. wars and militarism, support peace and human rights initiatives, and redirect our tax dollars into healthcare, education, green jobs and other life-affirming programs. Founded in autumn 2002 as a grassroots effort to prevent the US war on Iraq, we continue to organize for justice for Iraqis and to hold war criminals accountable. We actively oppose the continuing U.S. war in Afghanistan, torture, the detention center at Guantanamo, weaponized and spy drones, the prosecution of whistleblowers, U.S. support for the Israeli occupation of Palestine and for repressive regimes such as Saudi Arabia. Less than three weeks until Trump takes office! 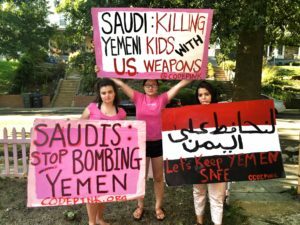 Stop all weapons sale to the Saudi regime!